Guitar capos are one of the most valuable accessories you can get as a guitar player. Sure, there are many others that allow you to do many great things, but capos add a whole new dimension of creativity. If you want to learn more about guitar capos, check out our article here ‘What are guitar capos’. Just like it’s the case with about anything else out there, you have a number of different capo types to choose from. These all come with different attributes and features. It’s safe to say that a single capo, no matter which one is it or how much it costs, probably won’t get the job done in every situation. With that said, it’s our goal today to show some different types of capos you can come across, and what each type offers in terms of performance and design. Some of them you will find interesting, while others probably won’t work for your playing style or application. Let’s start with the most basic type of capo. A spring-loaded capo is designed for speed. It’s super easy to put on and remove from the guitar, which is exactly why so many people like them. These also allow you to use them with just one hand since you operate it just like any other basic clamp. One of the most attractive benefits of spring-loaded capos is their simple design. This makes them pretty reliable in a sense that there aren’t many moving parts to worry about. However, their simple design also makes them pretty cheap to produce. But with all of these benefits, a few flaws are also present. One of the biggest flaws is the fact that you can’t manually adjust the amount of pressure the capo applies to the strings. On one hand, this can lead to the bending of the strings, but on the other, there may be a lack of pressure. Spring-loaded capos are definitely not recommended for serious use. If you just need a simple capo for your practice sessions or to play with your friends, that’s fine. 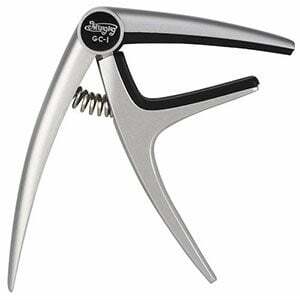 However, if you plan on performing live with a spring-loaded capo, you might want to look at something more reliable. For a more serious use, we recommend you look into C-Clamp capos. These devices are far more reliable and offer a more consistent performance than a spring loaded capo. What makes them so great is the ability to adjust the pressure exerted on the strings at all times. This is definitely an important level of control if you plan on performing live. C-Clamp capos are generally very rugged. Chances are there is nothing you can do to a C-Clamp capo that will make it fail. When it comes to cons of this type of capo, there aren’t many. The main problem people usually have with C-Clamp capos is the fact that they require considerably more effort to put on and remove from a guitar. You can pretty much forget about operating this type of capo with just one hand. In other words, you will want to put this capo on long before you plan on playing that guitar. Otherwise, it will take some time to install everything properly, and adjust the pressure. The only other drawback is their price. 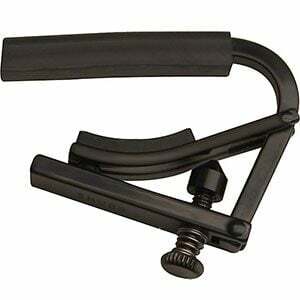 C-Clamp capos cost anywhere from 20-50% more than spring loaded ones. If C-Clamp capos are the very best solution, toggle capos are on the bottom of this scale. A toggle capo is a very lightweight, compact capo that often times uses a polyester band of some kind instead of a clamp. They are very easy to put on a guitar and come at prices which make them affordable enough to anyone. As a matter of fact, many people buy several of these just in case. The amount of pressure and pressure distribution of a toggle taco is inconsistent and decent at best. One of their main flaws is their tendency to come loose. On the other hand, they can lead to string bending as well. 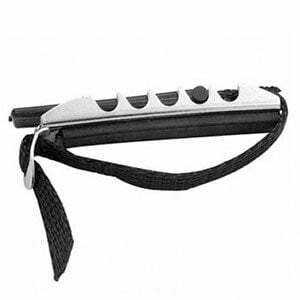 Generally, you would use a toggle capo for practice and home use. Using one of these for a serious performance would be unwise. There is just not enough consistency for that. As you probably figured out by now, there’s a bunch of different capos to choose from. Each of these three types of capos has its own subdivisions. It’s fair to say that every brand has their own solution that differs from that of their competition. Since there are so many out there, it’s definitely important for you to define what kind of use you have in mind for a capo before you go shopping for one. This will eliminate a bunch of models and types, narrowing down your choice to capos which fit your application. With all this stuff out of the way, feel free to check out our list of Best Capos for Guitar on today’s market.